Luke Gives D-Box a Shot with "Inception"
What is D-Box? Think of the ride “Star Tours” at Disneyland. You sit in a chair in a small room designed like a Star Wars transport shuttle. In front of you, a silver screen plays a movie – but you are supposed to take it as being the cockpit window. As the shuttle takes off and flies through dangerous situations, the room and seats that you are sitting in shake, rumble and move in harmony with the visuals you see on the screen in front of you. Basically, it is a physically interactive movie. D-Box attempts to do for action movies what “Star Tours” does with their original movie. Being bolted into the floor of a standard stadium seating movie theater, D-Box can’t quite accomplish what “Star Tours” can – the entire room cannot move, shift and shake; therefore, it will never quite catch up to the “Star Tours” experience. I know what you are thinking: Wouldn’t D-Box just distract from the movie? Yes and no. My D-Box experience was with Inception. Being my third viewing, I cannot say if it will be a distraction to everyone. I had already seen the film multiple times, so I put a lot more focus on the D-Box motion than I did the film. It was, however, my friend Scott Herring’s first time seeing Inception – and he loved both the movie and the D-Box experience. For me, already having seen the film, I found the subtle movements more effective than the big ones. 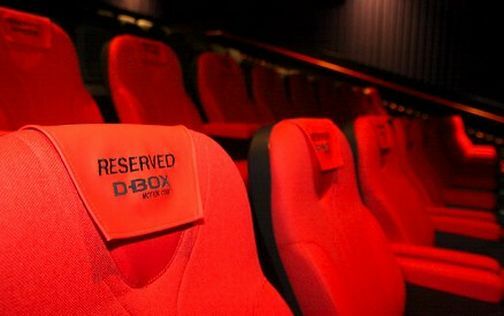 The D-Box seats are not in constant motion throughout the whole film. For Inception, the first time you feel the movement is approximately six minutes in. (SPOILER: You begin to feel the movement when Leonardo DiCaprio and Joseph Gordon-Levitt are in Saito’s dream castle and the dream begins to collapse on itself. END SPOILER). At first, the seats only rumble – and to be honest, it is pretty impressive. You get the feeling that you are watching a movie with an extremely loud sound system and the bass makes your chair vibrate, only you don’t have to deal with the excessively loud sound. But then the firings start. The motion control is designed to make you feel each and every gunshot throughout the film. And that is when it starts to become overkill. Any shaky camera, running down an alley, bumping and punching people scene in the movie is overdone with motion. During one scene, I relaxed my head, laying it back on the seat rest. When Leo suddenly kicked a henchman square in the face, the chair’s motion was so violent that it threw my head forward off the headrest. Overkill. But not all of the jerky violent shaking is in vain. At times, it is far more effective than watching the movie alone. In one scene, the use of unexpected motion used simultaneously with a visual “jump” scene caused a woman down the row from me to literally scream. (SPOILER: The scene where the team first enters Robert Fischer Jr.’s raining dream and Leo picks up Juno in his car, a train shows up out of nowhere and crashes into their car. The surprise motion combined with the shock of the visuals and the loud crashing sound caused that girl to scream. END SPOILER). The small subtle movements are the most effective. Any one of the film’s zero gravity scenes is better than the bumpy action-packed ones. (SPOILER: Joseph Gordon-Levitt’s hallway fight, people moving and elevator explosion scenes are downright awesome. END SPOILER). The movements of the seats in those scenes make you feel like you, too, are in a zero gravity environment. If at any time during a D-Box experience you feel like you are being jack hammered by your seat, you can always turn it down. D-Boxes have three control settings: high, medium and low. Unfortunately, there isn’t an “off” button – but if you end up hating it, you can always get up and get your money back or move to a non-D-Box seat. With everything said, it all comes down to your pocketbook. For example: here in Salt Lake City, Utah at the same South Jordan City theater (Megaplex at The District) that features D-Box, to see a P.M. showing of Inception in a normal seat costs you $8.50. To see it in a D-Box seat costs you $16.50, an additional $8! It is actually cheaper to see an IMAX showing of Inception at the Megaplex in Sandy, which only costs you $11. Are you willing to spend extra money to enhance your moviegoing experience? Note: D-Box chairs are also available to purchase for your own home theater. They can work in sync with select Blu-ray and video game titles. See the video below for more details on D-Box.